Aquaclio Hot /Cold Water Purifier (Shower Filter) 1. Aquaclio Counter-current Filtration Technology (CFT). 2. 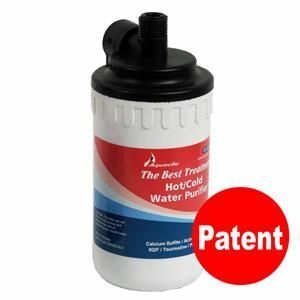 Aquaclio Patented Advanced Technology Filter Design – Hot & Cold Water Filtration 3. Removes Chlorine, Algae, Mould, Dirt, Rust, Odor, Agricultural Water Pollution; Pesticides.... Prevents Bacterial Growth 4. Cleaner, Safer Water for Baby Bath - Helps Skin Allergy, Face Washing, Make-Up Removing, Skin Caring, Tooth Brushing, Hand Washing, Cooking, Clothes & Linens Washing - Prevents - Dandruff & Hair Fall - The Safest Water Purification System to Wash Fruits & Vegetables 5. Backwash Feature – Extends Filter Service Life - No Drain, No Waste Water, No Electricity – Environmentally Friendly 6. Easy - Indoor & Outdoor Installation – Easy to Replace.